Based on how the game started, I never thought it would wind up being a feel good night that ended with a pimped out payback homer. DeGrom didn’t have his best command and looked especially shaky in the first inning. But he went full veteran ace mode and settled down to give the club 6 solid innings. 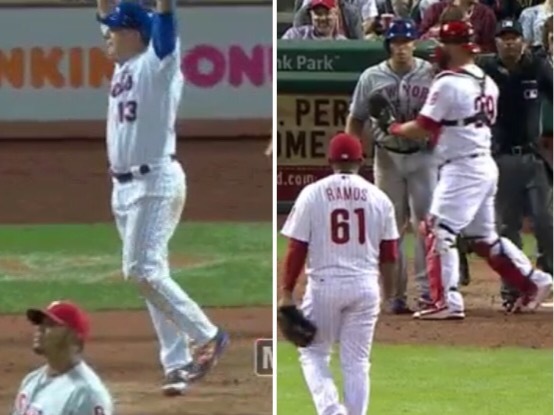 The mook in the Phillies bullpen who gave up the Asdrubal Cabrera bat flip walkoff homer last September decided to throw at Cabby’s head in the 8th inning of a tie game in April. Then Jay Bruce went full payback hero mode and launched a two-run moonshot to give the Mets a 4-2 lead that they would never surrender. (The bad news is the Mets only managed to scrape together four hits against the lowly Phillies and the team defense looked terrible again but let’s ignore that). DeGrizzled Veteran: Jacob deGrom pitched 6 innings, gave up 2 runs on 6 hits and 2 walks. He only struck out 3 hitters. Mediocre defense in the first inning helped the Phillies score their first run. After a leadoff walk and a force out at second base, Jose Reyes failed to catch an Odubel Herrera pop up behind third base. That set up runners on first and second for Maikel Franco who “singled” on a ball lined up the middle that Curtis Granderson should have been able to play in center field but instead deflected to right field. That loaded the bases for Michael Saunders who drove in the first run with a single and then deGrom walked Cameron Rupp to force in a run. It was 2-0 after the first inning but deGrom settled down. Big Bruce Ball 1.0: Jay Bruce hit a solo homer in the top of the 4th inning to cut the Phillies lead in half. I love how Jay was public enemy number one all offseason simply by virtue of existing, and now he’s the only guy hitting to start the season. It’s so scripted. Phillie Blessings: In the top of the 7th inning Jay “Middle of the Action” Bruce walked to leadoff the inning. Then Curtis Granderson hit a ball up the middle fielded by the second baseman who made an errant throw to first base. The error allowed Bruce to advance to third and set up first and third for Neil Walker. Neil hit a sac fly to even the score at 2. The Old Switcheroo: For some reason in the 7th inning with runners on first and second and two outs, Terry had Michael Conforto on deck to pinch hit for Jacob deGrom but then pulled him in favor of Wilmer Flores against a righty. Wilmer flew out to center. Terry really hates playing Conforto. Ridiculous Play: In the bottom of the 7th inning, Jerry Blevins came in to replace Josh Smoker who retired the first two batters but then gave up a single and walked a guy. Jerry proceeded to throw a pitch that bounced way out of the strike zone to Odubel Herrera. It was so far out of the zone that the baserunners thought it was going to the backstop. Travis d’Arnaud somehow fielded the ball, threw wildly to second base in an attempt to catch the runner off the base, Cabrera dove and fielded the wild throw, and then he threw to first base and was able to nail the runner at first for the final out of the inning. Thanks to the Phillies for running themselves out of an inning. BatflipGate Payback: With one out in the 8th inning, Edubray Ramos sailed a ball over the head of Asdrubal Cabrera as payback for Cabrera’s incredible September 2016 bat flip. The Philly Manager was tossed. Talk about a bonehead move by the reliever late in a tie game. I recently saw an interview with Philly manager Pete Mackanin, and he said he was trying to teach this young Philly squad how to play the game right. This is definitely a teaching moment. Also, Cabrera said after the game he had no idea who the reliever was and why he threw at him. I LOVE when players pretend they have no idea who a guy is as a way to insult them. 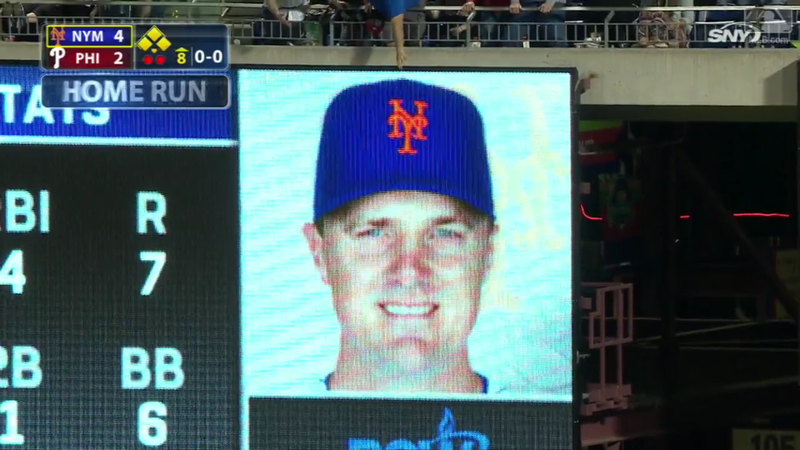 Big Bruce Ball 2.0: Once the heat died down after BatflipGate, Jay Bruce launched a two out 1-2 pitch from a lefty reliever into the right field second deck for the ultimate payback bomb. That gave the Mets a 4-2 lead, and it was enough for the victory. Addison Reed gave up a solo blast in the 9th inning but ultimately he sealed the deal. Bench Jose Please: Jose Reyes is basically batting zero in like 40 at-bats. Terry needs to get him out of the leadoff spot and find a way to give Wilmer Flores and T.J. Rivera some playing time. Jose is not a star like Yoenis Cespedes who gets playing time to work his way out of a slump. Jose is a utility player at this point. If he stinks, he sits. It ain’t hard. Play Conforto: Grandy blew a play in center in the first inning of this game. Statcast said it was a play made by center fielders 75% of the time. This is just another pointless reminder for Terry to rotate his old outfielders and get Conforto into a game. Juanny No Bats: Juan Lagares is due back from the DL soon. Maybe even this weekend. The outfield defense has been so bad that Terry is going to wind up playing Juanny no bats. I’m sure that’ll boost the offense. Today: Matt Harvey takes on Clay Buchholz. Clay is one of the the worst pitchers in baseball. We must crush him. Hopefully the Dark Knight continues to show positive signs on the mound as he recovers from his surgery.